University of Louisville students and officials were stumped in mid-February when a trailer closed Brandeis Avenue in front of the Ville Grill. John Karman, U of L’s director of media relations, said the street closure was approved by the city but the university was not notified. Metro Councilman David James was unavailable for comment. “The university is in contact with city officials and is promoting other locations for the trailer,” said Karman. 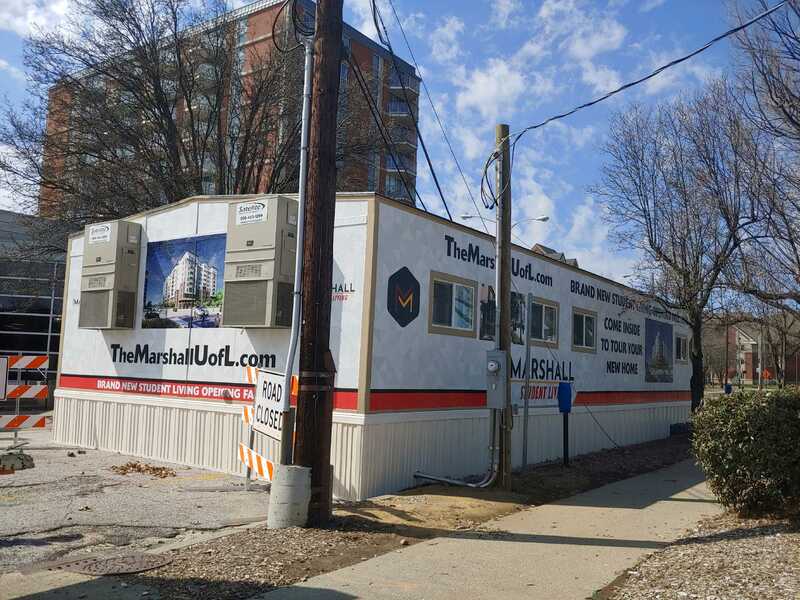 The trailer is supposed to be a marketing trailer and temporary leasing office for the Marshall Apartments. New Jersey companies Aptitude Development and Owl House are in charge of the project. The marketing trailer appeared Feb. 12 and closed Brandeis indefinitely as a result. The close is scheduled to last up to two years. The trailer has sat empty in its time blocking through traffic. Friday March 29 several workers were seen going in and out of the trailer with appliances and paint. The Marshall will be located at 2400 Fourth St. and is expected to open Sept. 2020. The apartments will be a 10-story complex with 231 apartments. Wyatt Harris, student government association student body services vice president, released a statement on Facebook March 8 discussing the matter. Wyatt said the university is working with the city and the developers to promote alternative locations for the trailer. “I fully support these efforts because I believe the selection of the current location of the trailer was a predatory action on the part of the developer to mislead students,” said Wyatt in his statement. Wyatt was unavailable for a direct comment for The Cardinal.